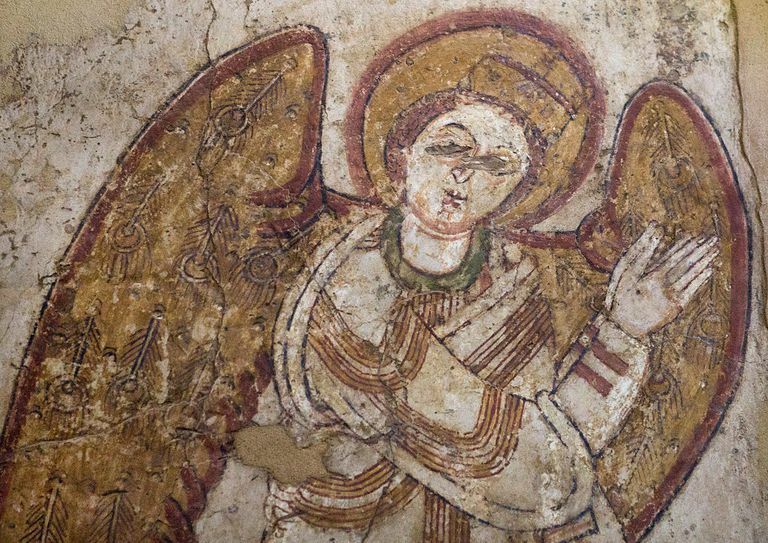 The Archangel Michael, in the Petros Cathedral in Khartoum, Sudan. The Seven Archangels—also known as the Watchers because they tend humanity—are mythical beings found in the Abrahamic religion underlying Judaism, Christianity, and Islam. According to the "De Coelesti Hierarchia of Pseudo-Dionysius" written in the fourth to fifth century CE, there was a nine-level hierarchy of the heavenly host: angels, archangels, principalities, powers, virtues, dominions, thrones, cherubim, and seraphim. The angels were the lowest of these, but the archangels were just above them. There are seven archangels in the ancient history of the Judeo-Christian bible. They are known as The Watchers because they take care of humans. Michael and Gabriel are the only two named in the canonical Bible. The others were removed in the 4th century when the books of the Bible were configured at the Council of Rome. The main legend concerning the archangels is known as the "Myth of the Fallen Angels." There are only two Archangels named in the canonical bible used by Catholics and Protestants alike, as well as in the Quran: Michael and Gabriel. But, originally there were seven discussed in the apocryphal Qumran text called "The Book of Enoch." The other five have various names but are most often called Raphael, Urial, Raguel, Zerachiel, and Remiel. The archangels are part of the "Myth of the Fallen Angels," an ancient story, far older than the New Testament of Christ, even though Enoch is thought to have been first collected about 300 BCE. The stories originate from the Bronze Age First Temple period in the 10th century BCE when King Solomon's temple was built in Jerusalem. Similar tales are found in ancient Greek, Hurrian, and Hellenistic Egypt. The names of the angels are borrowed from the Babylonian civilization of Mesopotamia. In contrast to the Jewish myth about Adam, the myth of the fallen angels suggest that the humans in the Garden of Eden were not (entirely) responsible for the presence of evil on earth; fallen angels were. The fallen angels, including Semihazah and Asael and also known as the Nephilim, came to earth, took human wives, and had children who turned out to be violent giants. Worst of all, they taught Enoch's family heaven's secrets, particularly precious metals and metallurgy. The resulting bloodshed, says the Fallen Angel tale, caused an outcry from the earth loud enough to reach the gates of heaven, which the archangels reported to God. Enoch went to heaven in a fiery chariot to intercede, but he was blocked by the heavenly hosts. Eventually, Enoch was transformed into an angel ("The Metatron") for his efforts. God then commissioned the archangels to intervene, by warning Adam's descendant Noah, imprisoning the guilty angels, destroying their offspring, and purifying the earth which the angels had polluted. Anthropologists note that as the Cain (the farmer) and Abel (the shepherd) story could reflect societal anxieties arising from competing food technologies, so the fallen angels' myth might reflect those between farmers and metallurgists. By the Second Temple period, this myth was transformed, and some religious scholars like David Suter believe it is the underlying myth for endogamy rules—who a high priest is allowed to marry—in the Jewish temple. Religious leaders are warned by this story that they should not marry outside the circle of the priesthood and certain families of the lay community, lest the priest run the danger of profaning his seed or the family line. However, for the Catholic church, as well as the Protestant version of the Bible, a fragment of the story is left: the battle between the single fallen angel Lucifer and the archangel Michael. That battle is found in the book of Revelation, but the battle takes place in heaven, not on earth. Although Lucifer battles a host of angels, only Michael is named among them. The rest of the story was removed from the canonical bible by Pope Damasus I (366–384 CE) and the Council of Rome (382 CE). The Archangel Michael is the first and most important of the archangels. His name means "Who is like God?" which is a reference to the battle between the fallen angels and the archangels. Lucifer (a.k.a. Satan) wanted to be like God; Michael was his antithesis. In the Bible, Michael is the angel general and the advocate for the people of Israel, the one who appears in Daniel's visions while in the lion's den, and leads God's armies with a mighty sword against Satan in the Book of Revelation. He is said to be the patron saint of the Sacrament of the Holy Eucharist. In some occult religious sects, Michael is associated with Sunday and the Sun. Gabriel's name is translated variously as "the strength of God," hero of God," or "God has shown himself mightily." He is the holy messenger and the Archangel of Wisdom, Revelation, Prophecy, and Visions. In the Bible, it is Gabriel who appeared to the priest Zacharias to tell him he would have a son called John the Baptist; and he appeared to the Virgin Mary to let her know that she would be soon giving birth to Jesus Christ. He is the patron of the Sacrament of Baptism, and occult sects connect Gabriel to Monday and the moon. Raphael is in the apocryphal book Tobit, and he is the patron of the Sacrament of Reconciliation and connected to the planet Mercury, and Tuesday. These four Archangels are not mentioned in most modern versions of the Bible, because the book of Enoch was judged noncanonical in the 4th century CE. Accordingly, the Council of Rome of 382 CE removed these Archangels from the list of beings to be venerated. Uriel: Uriel's name translates to "Fire of God," and he is the Archangel of Repentance and of the Damned. He was the specific Watcher assigned to watch over Hades, the patron of the Sacrament of Confirmation. In the occult literature, he is connected to Venus and Wednesday. Raguel: (also known as Sealtiel). Raguel translates to "Friend of God" and he is the Archangel of Justice and Fairness, and patron of the Sacrament of Holy Orders. He is associated with Mars and Friday in the occult literature. Zerachiel: (also known as Saraqael, Baruchel, Selaphiel, or Sariel). Called "God's command," Zerachiel is the Archangel of God's Judgment and the patron of the Sacrament of Matrimony. The occult literature associates him with Jupiter and Saturday. Remiel: (Jerahmeel, Jehudial, or Jeremiel) Remiel's name means "Thunder of God," "Mercy of God," or "Compassion of God." He is the Archangel of Hope and Faith, or the Archangel of Dreams, as well as the patron saint of the Sacrament of Anointing of the Sick, and connected to Saturn and Thursday in the occult sects. Brittain, Alex. "The Catholic Teachings On The Angels – Part 4: The Seven Archangels." Catholic 365.com (2015). Web. Bucur, Bogdan G. "The Other Clement of Alexandria: Cosmic Hierarchy and Interiorized Apocalypticism." Vigiliae Christianae 60.3 (2006): 251-68. Print. ---. "Revisiting Christian Oeyen: "The Other Clement" on Father, Son, and the Angelomorphic Spirit." Vigiliae Christianae 61.4 (2007): 381-413. Print. Reed, Annette Yoshiko. "From Asael and Šemiazah to Uzzah, Azzah, and Azael: 3 Enoch 5 (§§ 7-8) and Jewish Reception-History of 1 Enoch." Jewish Studies Quarterly 8.2 (2001): 105-36. Print. Suter, David. "Fallen Angel, Fallen Priest: The Problem of Family Purity in 1 Enoch 6 and 20:14;16." Hebrew Union College Annual 50 (1979): 115-35. Print.